A row of cots lined up inside the Oak Lawn United Methodist Church, which opened its doors to shelter the homeless on the coldest nights of the year. Photo courtesy of Oak Lawn United Methodist Church. And in the process, shows how Dallas can get past the dysfunction hampering its homeless response system. The people working to help Dallas’ homeless unquestionably have their hearts in the right place—charitable souls dedicated to the city’s neediest residents. Which makes the failures of our homeless response system, much of it dysfunctional and bogged down by political finger-pointing in even the most generous of readings, all the more frustrating. One church’s actions last month, however, should serve as an example of how we can do a better job reaching those we too often keep at a distance. When temperatures dipped below freezing early this year, the Oak Lawn United Methodist Church opened its doors to feed and house its homeless neighbors overnight. The church wasn’t outfitted to be a shelter, but it had heating and space. It had pews and cushions, and a roomy office and lobby area with couches and seating. It had a clothes closet as part of its regular homeless ministry, and on Sundays already offered free meals. One freezing Sunday night, as some of the church’s homeless neighbors came for a meal and a little warmth, the Rev. Rachel Baughman asked them to stay after dinner. She was inspired by suggestions from a few members of her congregation and by memories of her father, a pastor in West Texas, letting the homeless residents of Sonora sleep in the pews years ago. 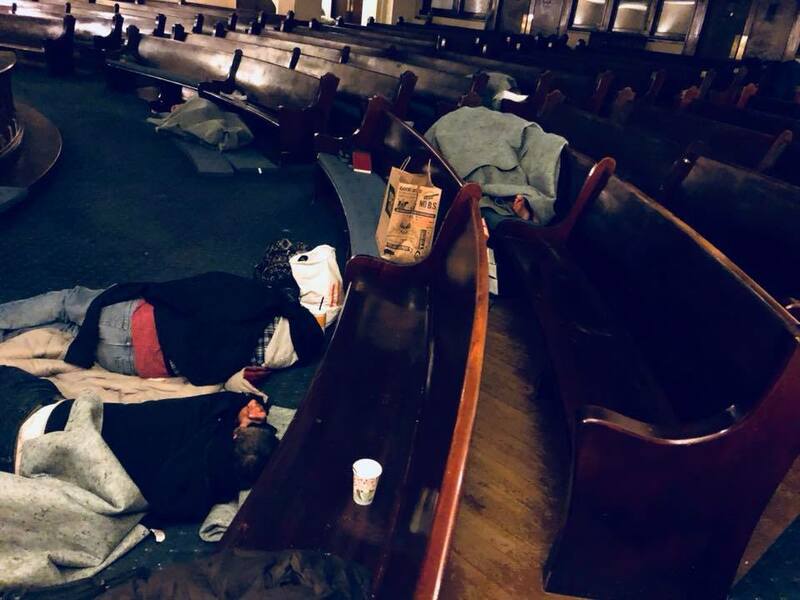 That first night, the church hosted a little more than 30 people, including six who already spend many nights sleeping outside on the church’s property on Cedar Springs. By Jan. 17, bolstered by volunteers and donations from the congregation and Dallas residents who had seen the TV news coverage, the church was welcoming closer to 80 people, many of them kept out of shelters that were already at capacity. Launching a “pop-up shelter” proved to Baughman the complexity of coordinating with the many agencies that address homelessness, and the importance of cutting through the politics that entangle them. As Baughman is quick to acknowledge, this doesn’t come close to providing a long-term solution to homelessness. Long-term solutions seem impossible to comprehend when there isn’t yet even a viable system in place for sheltering people on freezing nights, a life-or-death issue. Photo courtesy of the Oak Lawn United Methodist Church. “There’s no reason in a city where we have so many heated buildings to have homeless out at night,” Baughman says. She intends to continue opening up the church on nights where the temperature drops below freezing, and to help coordinate with shelters and other churches in the area to develop a further-reaching plan for those nights. Some of that collaboration is already happening. A Dallas shelter has donated 60 cots to the Oak Lawn church, and Baughman says she was touched by the number of organizations, secular and religious, that reached out after hearing about the church’s efforts. Other dilemmas remain. For example, how to ensure that homeless people outside of the city center can be transported to a warm shelter? At the very least, there’s something to be learned from how the church treated those in need. Not as nuisances, or problems needing to be solved. Beyond filling a very real need for an emergency shelter plan, the last month has also helped Baughman’s congregation grow, she says.